The event is hosted in multiple languages, has many dedicated servers per platform, a platoon, and an exclusive Dog Tag. There’s also an official Discord server with channels for each language and above all, a fun and welcoming environment. Every Battlefield 1 player can join. It's an event for you - the community. Event servers are available on PC, Xbox One, and PlayStation® 4. How do I join #FridayNightBattlefield? Simply search for “#FridayNightBattlefield” in the server browser on Friday nights starting 4 AM PT/1 PM CET. Below you can find the server details for Battlefield 1. We provide more #FridayNightBattlefield servers as players join, so there's always room for more. Where can I get more information about the weekly objectives in #FridayNightBattlefield? I heard there’s a #FridayNightBattlefield Dog Tag* for Battlefield 1. How do I get it? Joining one of the event servers listed above is a good start. Codes for Dog Tags are handed out to players based on a variety of criteria. This may include “Knife the VIP”, coming on top of the leaderboard, or other tasks. Criteria may differ from week to week and event server to event server. There might also be in-game community missions from time to time. Keep an eye out for #FNBF staff running weekly tasks or giving away codes throughout the event for a chance at the Dog Tag. 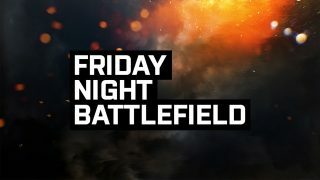 For more info about #FridayNightBattlefield, join the Discord server, and visit the official forum thread or https://www.fridaynightbattlefield.com. *THIS OFFER IS BEING ISSUED TO YOU FOR PROMOTIONAL PURPOSES ONLY AND DOES NOT CONSTITUTE A CREDIT, CHARGE, DEBIT OR GIFT CARD. LIMIT ONE DOG TAG PER EA ACCOUNT. PARTICIPATION AND ACCESS TO IN-GAME CONTENT REQUIRES BATTLEFIELD 1 APPLICABLE PLATFORM, EA ACCOUNT, INTERNET CONNECTION, AND (FOR CONSOLE PLAYERS) AN XBOX LIVE GOLD OR SONY ENTERTAINMENT ACCOUNT.